The best place to begin your Smoky Mountain adventure is right here at BEARFOOT ADVENTURE! Just imaging waking up every morning in this spacious 2 bedroom, 2 bath authentic log cabin. 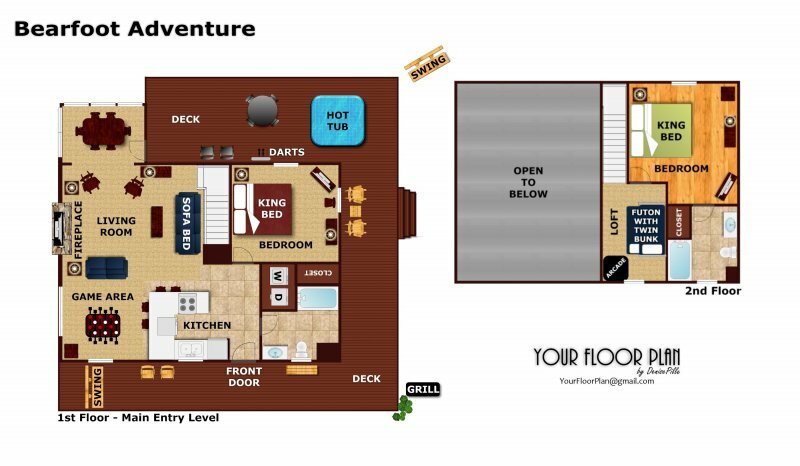 Privately located on two oversized lots between Pigeon Forge and Gatlinburg in the Sky Harbor resort community - BEARFOOT ADVENTURE is secluded, but still convenient to all the shows, dining, shopping, and attractions of town. Enter from level parking bordered by split rail fence and antique farm implements, across the wrap around porch, and into a huge living area. The open concept floor plan includes tall vaulted ceilings, a dining area, game area, kitchen with breakfast bar, and a large living room. Two KING bedrooms and two bathrooms offer guests their own space. The covered back porch includes a steamy hot tub, and a full length deck is perfect for relaxing to the sounds of nature. Call today and get your mountain adventure started in BEARFOOT ADVENTURE! We loved this place! Thank you for a great weekend. Very clean, well kept cabin loaded with amenities. Beautiful, quiet location. Our only regret was that we didnt stay longer. A perfect view of God's painted picture, A place where my family can spend quality time with one another (As my husband is gone week's at a time), A beautiful dining room table we can all join as one and eat while looking at the most beautiful view!It's vacations like this that make the drive all worth it!! The cabin was clean and very warming.. Can't wait to enjoy the rest of are time here and plan next year's trip!! Everything was smooth from the original booking to check out. Beautiful cabin with plenty of games and places to relax. Talk about piece and quiet. That was one thing i wanted and and was not disappointed. Not cabins close and could just listen to nature. Was very clean and well maintained. Will definitely be back. This cabin was perfect for our family! The amenities, the d?cor, we loved each moment! We saw wild turkeys as soon as we got there...we watched them for quite some time! The free wifi was a wonderful added bonus! And when we left to come home, we sadly hadn't seen any bears, but on our way down the mountain, a mama bear and her triplets walked right in front of our van! It was awesome and they were such a blessing to see! We'll gladly stay in Bearfoot Adventure again and again!!! Our trip was Fantastic. If I can use this cabin every single time I will. I've used APG for over 8 years and our 1st cabin was good - but i couldn't get back to it. The rest were either to small, or just not what the pictures displayed. This time - the owner was amazing and had the best customer service experience. She showed me pictures and said "place your self in this cabin before renting". That meant alot. Everything you see in the pics is what you get an more. Very spacious and clean. We went on a church outing and even the parents loved it. We will be back. Thank for a great experience. Had a wonderful time. The cabin was beautiful and we look forward to coming back real soon!